Dara mandir /Mahakal Mandir is a Hindu Temple few mintutes walks form Darjeeling Town. Its one of the oldest holy temple of Darjeeling hills. 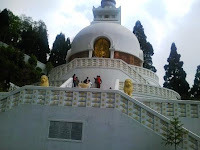 Generally the place is also called Observatory Hill famous for Kanchanjunga view. Sinchel Dham is present in Tiger Hill ,its one of the beautiful holy places in Darjeeling Hills having several Hindu temple where thousands of devotes visits ever year, It has a water reservoir for the supply of water for Darjeeling town and few surrounding areas of Darjeeling. Dali Monastry is just a few kilometer drive from Darjeeling Town,It is also known as Druk Sangag Choling Monastery. Ghum Monastery or Ghoom Monastery is the popular name of Yiga Choeling Monastery located at Ghum at an elevation of 8,000 feet, 8 km from Darjeeling . Darjeeling has several holy places and temples among them Japanese Temple is one of the beautiful Buddhist templew among them,Its also known as Nipponzan Myohoji Buddhist Temple in Darjeeling,the temple is located near the peace pagoda.Japanese Temple of Darjeeling was built in the year1972,the temple stand on the philosophy of peace and spirituality.The best part of the Temple is the time when prayers are chanted.The humming prayers gives the touch of heavenly feel.Its nearly about 2 km from the proper market. Did you liked it..? Book it Now..!